The property is conveniently situated on Dymchurch Road, a relatively short walk from the town centre with its range of independent shops, boutiques, cafes and restaurants, doctors' surgeries, dentists etc. The town is also well served by 4 supermarkets including Waitrose, Aldi & Sainsburys, Sainburys being a short stroll over the The Royal Military Canal which is opposite the property with pleasant towpath walks and cycle path. The attractive, unspoilt seafront and long pebbly beach is also accessible. There is a wide variety of sporting and leisure facilities in the area, including the Hotel Imperial Leisure Centre, cricket and lawn tennis clubs, 2 golf courses, sailing club, etc. There are many clubs and societies within the town that welcome new members, and a monthly farmers' market. There are bus stops close by with local services to Folkestone, Ashford, Romney Marsh, etc. and Hythe is very conveniently located for easy access to the M20 (Junction 11 - 4 miles), Channel Tunnel Terminal (4 miles), the ferry port of Dover (10 miles) and Ashford International Passenger Station (11 miles). Sandling main line railway station, approximately 2½ miles away on the outskirts of Saltwood, offers regular commuter services to London and High Speed trains to London St Pancras are available from Folkestone and Ashford. 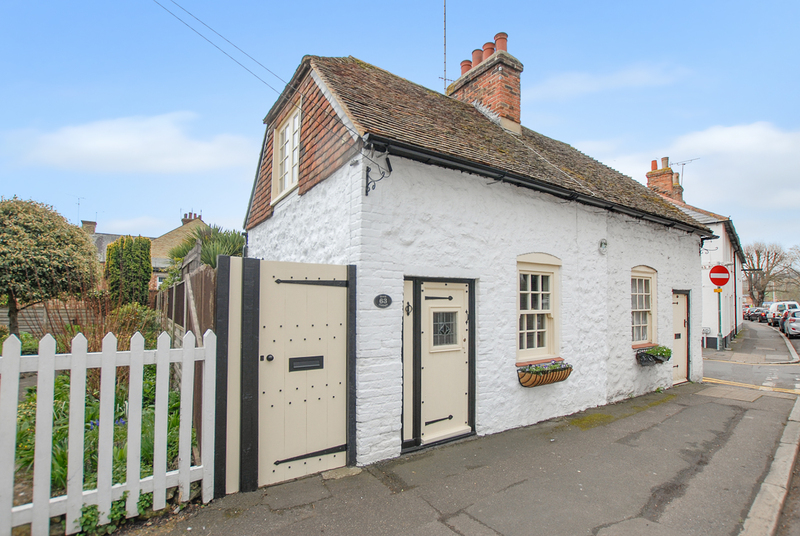 This enchanting period cottage, which benefits from not being Listed, has been lovingly improved by the current owners and now offers immaculately presented accommodation which exudes charm, character and original features throughout. The cosy sitting room benefits from an open fire and leads to the well fitted kitchen and adjoining utility area to the rear. Beyond this a spacious conservatory overlooking the garden. The master bedroom with its vaulted ceiling and exposed beams leads to a smartly fitted en suite bathroom. To the rear of the cottage is a charming and secluded courtyard garden which enjoys a southerly aspect and provides a delightful environment in which to relax and dine alfresco. Within the garden are two very useful outbuildings one of which is supplied with power. For room sizes please refer to the Floor Plan.